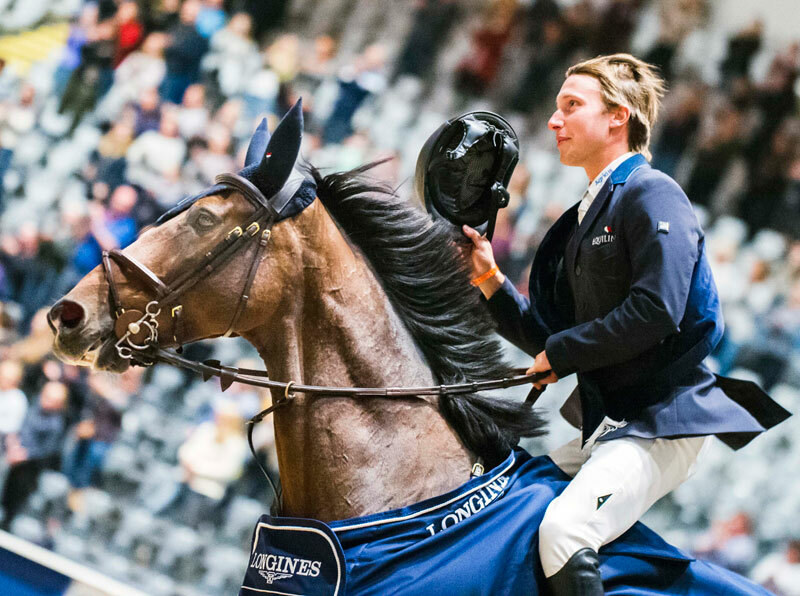 Sweden’s Douglas Lindelöw (27) and his brilliant bay gelding Zacramento threw down a really courageous performance to win the first leg of the Longines FEI Jumping World Cup™ 2018/2019 Western European League in Oslo, Norway today. Fourth to go in the 12-horse jump-off, and followed by many of the world’s best, they posted a formidable target that proved way too fast for the rest. When he was told afterwards that he’d been very brave after stopping the timers in 44.67 seconds, the Swedish star laughed and replied, “I thought so too!” He’d just pinned Rio 2016 Olympic team gold medallist Kevin Staut (37) from France into runner-up spot and Australian star Edwina Tops-Alexander (44) into third, so he had every reason to be happy. There were seven double-clear rounds, with Italy’s Luca Moneta (Connery) and Michael Cristofoletti (Belony) slotting into fourth and fifth places ahead of Germany’s Hans-Dieter Dreher (Twenty Clary) in sixth and Ireland’s Denis Lynch (The Sinner) claiming seventh spot. A total of 38 horse-and-rider combinations from 16 countries arrived at the Telenor Arena in the Norwegian capital city with the same goal of picking up some precious early qualifying points for the Final which, in this 41st season, returns to where it all began in Gothenburg (SWE) next April. That’s Lindelöw’s big target right now. “I am based in the south of Sweden so of course I want to get to Gothenburg,” said the rider who was a member of Sweden’s silver-medal-winning team at the FEI European Championships last year, and who has an impressive record at Longines FEI Jumping World Cup™ Finals. He finished eighth with his former ride, Casello, in Las Vegas (USA) in 2015 and 11th with Zacramento at the Final in Paris (FRA) earlier this year. It was Italy’s Michael Cristofoletti (Belony) who set the target at 46.70 seconds when second to go in today’s jump-off, but Lindelöw shaved more than two seconds off that with a fearless run from his 13-year-old Swedish-bred horse. Belgium’s Olivier Philippaerts (H&M Legend of Love) and Italy’s Alberto Zorzi (Contanga) were quicker, but both left a fence on the floor, and it was last man in, Kevin Staut with Silver Deux de Virton HDC who came closest to Lindelöw’s time as he crossed the line in 45.51 seconds. And he also pointed out that they made the right decision when sticking with the time-allowed they had set before the action began, even though even though some of the early starters picked up time faults. “The time was exactly as it should be and it was good they didn’t change it at the start”, Staut pointed out. Lindelöw’s next plan is to collect some more qualifying points at the third leg of the Western European League in Verona (ITA) in two weeks’ time. Before that however there will be another afternoon of edge-of-the-seat excitement when the series visits Helsinki (FIN) next Sunday.